A bathroom can be a sanctuary in a home; a comfortable space where we can retreat and escape from the stresses of work, family and the world in general. A comforting bath, a relaxing shower, and other amenities make bathrooms important parts of any home. S & W Kitchens is a bath remodeling innovator, specializing in transforming ordinary bathrooms into luxurious and functional living spaces. Be sure to browse our website's PORTFOLIO for ideas on how we can help you create that special feeling in your own bathroom. S & W Kitchens will help you create the right design for you and your family, then combine quality cabinets and fixtures with the craftsmanship needed to assemble them all into an impressive bath. Visit one of our showrooms. You can browse a number of styles, colors and types of cabinets in a relaxed, comfortable atmosphere. 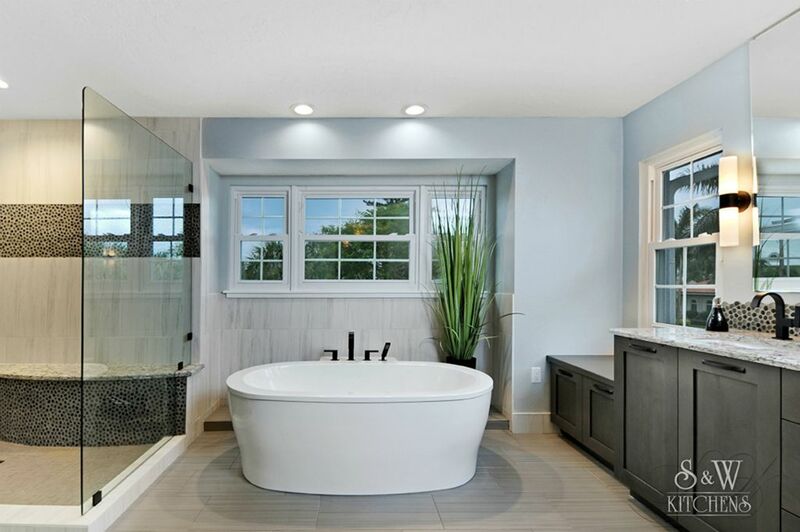 You will see the cabinets, countertops and tile selections fully installed and on display, better envisioning what style will look best in your perfect bathroom. We also can use state-of-the-art computer technology to create a virtual bathroom design so you can see the completed project before it is installed in your home.